Last Wednesday, a tall, wide-smiling usher opened the door, bringing me into the Chicago Art Department’s musky, glowing warmth. Nothing—the art, the lights, or the makeshift bar bustling with customers—was quite as compelling as the noise. It was loud. Not in an interruptive way, but I could hear laughter from across the room, and see and feel it bouncing from one group of people to the next. The tall ceiling, strung back and forth with yellow lights, only helped matters along, allowing notes of R&B music to fill the air. Couples’ heads were bent down, ears inches from mouths, while friends howled excited greetings at every new face that walked through the door. Hugs were given without discretion, and kisses planted in abundance. The February 15 Chicago release party of the crowd-funded web series, Brown Girls, couldn’t have started the night in a more beautiful atmosphere. Written by poet Fatimah Asghar and directed by filmmaker Sam Baily, both from Chicago, the show—which is filmed and set in Pilsen—revolves around the friendship of two women of color as they face the trials of young adulthood. Leading up to and since its release, a number of local and online outlets including the Tribune, the Reader, and Remezcla have sung the series’ praises. All of the press has commended the show for centering women of color, but nowhere else was the community that Brown Girls is for, about, and supported by more apparent, than at the release party. The venue quickly reached capacity, and was filled with a youthful, diverse crowd of expectant fans, draped in styles ranging from South Asian saris to studded leather jackets. Each face I spotted was overwhelmed by a smile. Groups and lone partygoers alike were unguarded and open, willing to sit and spark a conversation or chat about a work of art. An accepting sense of community was palpable, perhaps simply because everyone was there for the same reason: to support and celebrate the stars and creators of the series—queer women of color. It is not a coincidence, then, that the event itself seemed to exude a gorgeous feminine energy that touched every piece of art and every performance of the night. 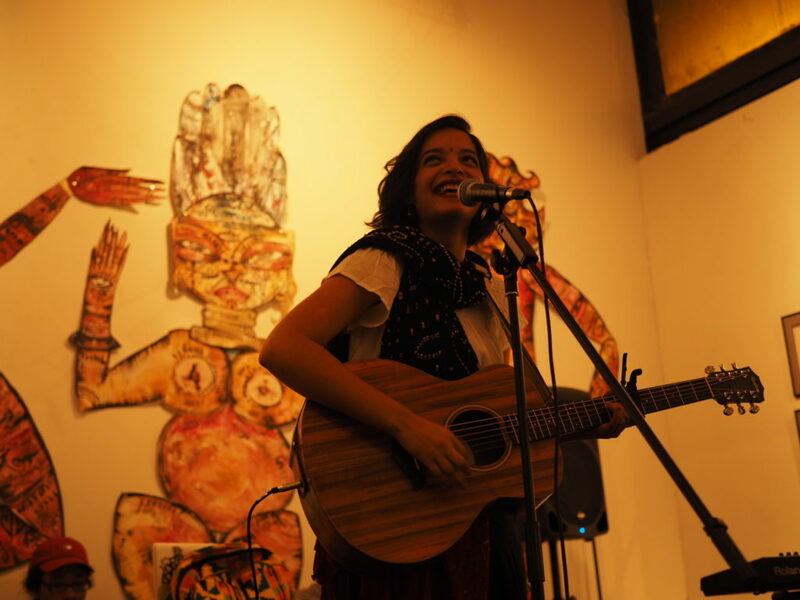 The evening was divided into two parts: musical performances and a screening of the show’s first season. Burlesque performer and emcee Jeez Loueez took the stage first; her bright floral headpiece and translucent, shimmering dress captured the attention of even the rowdiest stragglers in the back of the room. She introduced the opener, Po’Chop, the striking burlesque alter ego of Jenn Freeman. Po’Chop split the crowd down the middle, forming a column of space to fill with her provocative blend of contemporary dance and speechless acting. The fierceness of her expression hushed the crowd, and the performance ended with shouts and whistles of support. The crowd decided to sit down to allow those in the back to see, turning the night into a summer camp–like experience, with a mass of young adults sitting cross-legged on the ground. Po’Chop was followed by Swati Tiwari and Nabila Hossain, one of the leads of Brown Girls, performing a bouncy Bollywood dance. The rest of the evening was filled with acts that ranged from a standup set by Sonia Denis, the other lead actress of the series, to a striptease by Jeez Loueez herself; in between, all I could hear were encouraging shouts from the audience. 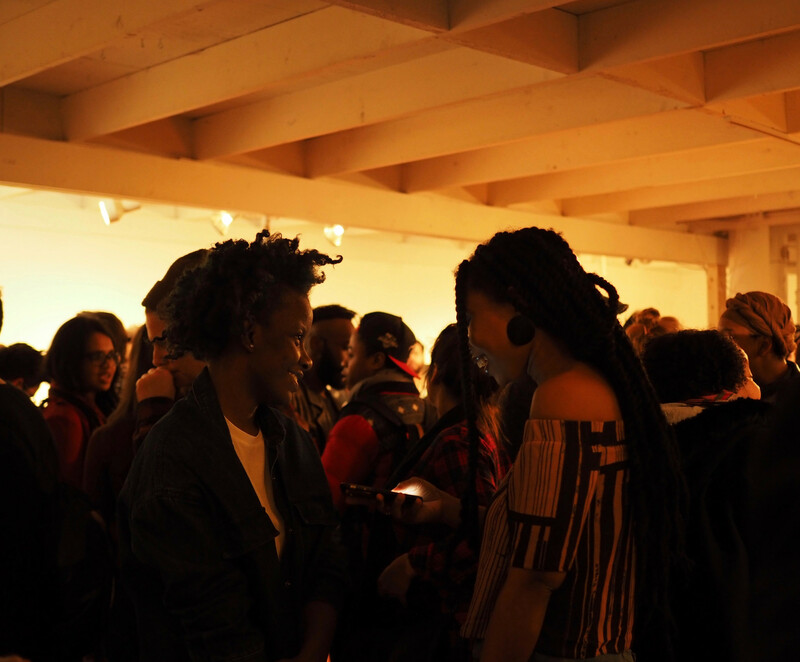 It was a night that overflowed with positive energy, with women supporting women and queer people of color celebrating one another. The final two performers of the night were the writers and singers of the Brown Girls theme song, Lisa Mishra and Jamila Woods. Woods is Fatimah Asghar’s best friend, and Asghar used their friendship as inspiration for that of the lead characters, Leila and Patricia. Mishra and Woods’s performance blended their musical styles in a collaboration that reflects a central message of the series: that not only women of color, but also women of different colors, must help each other in learning to love themselves fully. Immediately after this last performance, the crowd came to its feet and made its way to the screening room to catch the first glimpse of the series itself. The room was filled to the brim, a happy mess of bodies pushed against each other, with people even spilling into the next room. The intimacy that was created, although slightly uncomfortable and most definitely too warm, was exactly what the premiere seemed to be about: Brown Girls is a series about friendship, and the connections we make with people that shake our lives in unexpected and unprecedented ways. After watching the first season, which consisted of seven episodes, people were dancing, laughing, and crying, already eager for the story to continue. There were moments during the screening when I could see the faces of the audience mimicking the faces of the actors, as people saw themselves reflected in Asghar’s characters and their interactions. Although cheesy at times, the show ultimately made the audience relate to its characters and their circumstances, creating an unspoken sense of belonging amongst the crowd. The screening ended with shots of the main characters dancing, but the music was entirely drowned out by applause. Asghar edged to the front of the audience, humbled by the reception of her work, and closed the night with her thanks. Almost unable to speak as she began to tear up, Asghar thanked Woods especially for encouraging her to create and write Brown Girls. The night turned out to be so much more than just the premiere of a web series. It was about a community that brought itself together to celebrate groups of people who deserve yet rarely seem to receive support. It was for young queer people, for artists and creators, for brown and black women and the power of their friendship. Asghar seemed overcome with the beauty of it all. Her closing words served as the send-off of the night: “You don’t know what you are capable of until you do it.” She and her friends had unapologetically done it, and undoubtedly succeeded. It was beautiful to hear such a raw and honest description of the event. Your voice and excitement are tangible throughout the piece- I felt like I was there, smiling along with you and everyone else.